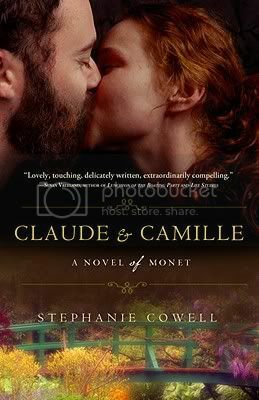 Just under a year ago, I read a beautiful historical novel about the love between Claude Monet and his muse and first wife, Camille. Not only did it tell a beautiful love story and give insight into the life of Claude Monet and his rise to fame, but it also gave me a context I had previously lacked for the Impressionist movement. Stephanie also wrote a very interesting guest post last year about how to piece together an historical novel. If you are someone who likes to wait for things to come to paperback before buying, now’s your chance! I have five copies to giveaway to readers with US mailing addresses, mailed by the publisher. Enter by the end of the day on Friday, April 1. This giveaway is sponsored by the publisher. Thanks for the giveaway — I’ve seen so many people rave about this book – I’ve loved Monet’s art for forever but no nothing about him! I may have accidentally entered twice, sorry. I couldn’t remember if I had entered yesterday and this is a book I really want to read. Thanks for hosting.